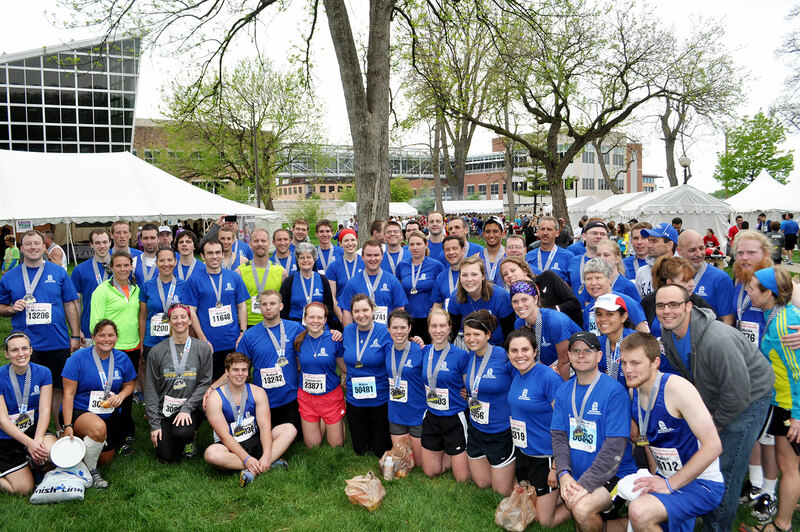 When Father Stephen Banet ran the OneAmerica 500 Festival Mini-Marathon on May 4 in Indianapolis as a part of the Race for Vocations team, he was in the 36th year of his priestly life and ministry. It was also his 64th birthday. Running in the mini marathon as a member of the team on the same day was transitional Deacon Daniel Bedel, 25, who had been ordained less than a month prior on April 6. Two men dedicated to running a long-distance spiritual race of service to God and the Church ran on the streets of Indianapolis to promote the idea that every person has a vocation. Deacon Bedel, a member of St. John the Evangelist Parish in Enochsburg, is close to the end of an eight-year journey through seminary formation, and said after the Mini-Marathon that there are similarities between the two. “Both of them whipped me in one way or another and forced me to grow,” he said. “Both require a sense of commitment and discipline that is all too lacking in the world today. Both demand patience, practice, and lots of prayer. Having approximately 300 teammates and other supporters of the Race for Vocations team was helpful for Father Banet, pastor of St. Jude Parish in Indianapolis, not just as he ran the race, but in his life and ministry as a priest. “Myself, being a priest now for 36 years, to see young people especially and other people joining in with that is truly supportive and energizing,” Father Banet said. One of the people supporting Father Banet and Deacon Bedel on the team was Kate Cameron, a member of St. Monica Parish in Indianapolis. Many team members gathered the night before the Mini-Marathon for a Mass for Vocations celebrated at St. John the Evangelist Church in Indianapolis, just blocks away from the event’s starting and finishing lines. Archbishop Joseph W. Tobin was the principal celebrant at the liturgy, which was followed by a pasta dinner for the team members, their families and friends. Deacon Bedel said that the Mass is an “absolutely critical” part of the experience of being on the Race for Vocations team. In addition to the prayers offered up for vocations and for the team during the Mass, other supporters were dedicated to prayer during the months of training leading to May 4 and on the day of the Mini-Marathon itself. All five Catholic dioceses in Indiana co-sponsor the Race for Vocations team. 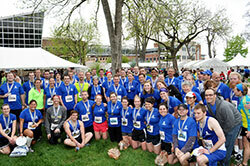 When the Mini-Marathon and the Finish Line 500 Festival 5K started on May 4, the members of the Race for Vocations team all had their distinctive blue T-shirts on and fanned out among the nearly 40,000 participants in both events. Deacon Bedel saw this display as a way of proclaiming the Gospel in the public square. “It’s just another part of the new evangelization, which ironically looks very much like the old evangelization,” he said. “The missionaries of the early Church used the traditions and culture of the people they evangelized to preach the Gospel message and spread the Good News. That’s exactly what we did. For Father Banet, that evangelization continued after the Mini-Marathon when he posted on his Facebook page photos of himself and some of the 30 members of his parish who were on the team.